I’m not a big fan of Daylight Savings Time as my lurkers already know. It’s not getting any better. Becky’s not a big fan of the deserts of Arizona, but its position as the lone state refusing to participate in this madness makes living there seem more attractive. I was dragging when I got up this morning and I was dragging all the way through lunch. It’s about 11:00 pm as I’m writing this and I’m not sleepy. It will take me a couple of weeks to get on the new cycle. 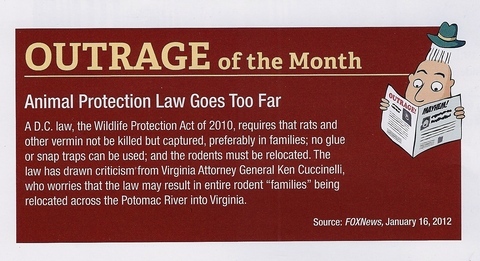 For those of you that have to deal with me, bear with me please. I will try not to be any more surly than absolutely necessary. As I was trying to wake up this morning I ran across this article in the LA Times which didn’t make me feel any better with its discussion of the dark side of DST including anxiety, heart attacks and car accidents. Sleep deprivation is a wonderful thing… NOT! Can you imagine having Daylight Savings Time listed as the cause of death in your obituary? Once again, in an attempt to make lemons into lemonade, I’ll remind you that this is a good time to check/replace the batteries in your smoke detectors. Those of you that are sleep impaired like I am need all the help you can get as you acclimate to this unnecessary assault on your internal clocks… Sweet Dreams! All of the news organizations are lathered up about today being “Super Tuesday“. It’s all a little frustrating as I generally feel like the decisions on the national candidates have been made long before Indiana’s Primaries roll around. Hoosiers have the opportunity to support candidates financially before the primaries, but in the end it’s the votes that count. I guess we’ll have to see if the new method of awarding delegates makes Hoosier votes relative this year. Along with the changes with the national delegate counts, we’ve seen some local changes as well. 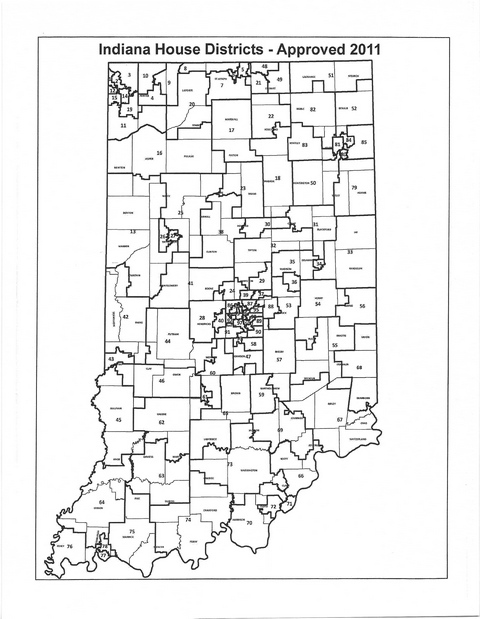 For those of you that haven’t seen the new district maps, Marshall County occupies the majority of Indiana House District 17. Fulton County to the south shares a portion of District 17 as well. (See the map to the right) We will no longer be “represented” by Nancy Dembowski as she will be in District 20. The latest information I’ve received is that she didn’t file to run so she is retiring after this year. That will leave Tom Dermody to run unopposed in the general election. Mr. Dermody is the current Representative for District 20. There are currently two Republicans, Francis Ellert and Tim Harman, running in the primary to represent District 17. As of this time I haven’t had the chance to learn too much about Mr. Harman, but I did support Francis Ellert in 2010 (previous blog post here) and feel he would do a good job representing the interests of our district. On the Senate side, Marshall County is split along what appears to be township lines. 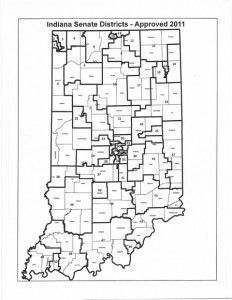 (See the map to the right) West Township along with Union, Green, Walnut and Tippecanoe Townships along the south side of the County fall into Senate District 18. 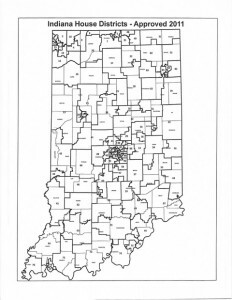 District 18 covers all or part of 5 additional counties south of Marshall County. 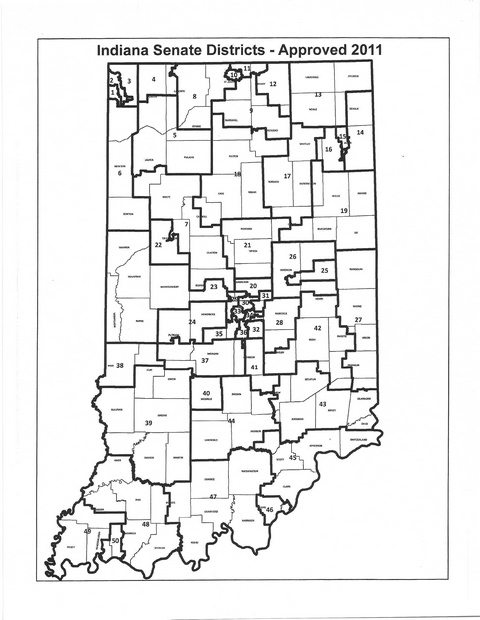 The remainder of Marshall County is part of Senate District 9 which includes portions of Elkhart, Kosciusko and St. Joseph Counties to the north and east. State Senator Randy Head currently represents District 18 which includes Culver. Senator Head came to Culver to speak last Saturday, but unfortunately I was unable to attend. Hopefully Culver generated a good turnout for him! Senator Head is running unopposed in the primary and general elections. State Senator Ryan Mishler currently represents District 9 which includes Plymouth and the remainder of Marshall County to the north and east. Senator Mishler is running unopposed in the primary and general elections. I would encourage you to take the time to learn about Francis Ellert and Tim Harman. We often mistakenly think that our State representatives aren’t important, but they are key to decisions that affect our daily lives and how competitive our State is nationally and worldwide. I’ll be cursing their decision a few years back to go to Daylight Savings Time when the alarm goes off next Monday just as I cheered their decision to implement Right to Work in the current session. This is the TrekDesk. It comes in several models and is supposed to be adaptable to any treadmill. Their site quotes the American Heart Association, saying that 10,000 steps a day can reduce your chances of a heart attack. It also quotes the National Institute of Health saying that walking reduces the risk of Cancer and quotes the American Diabetes Association saying that walking reduces the risk of Diabetes. 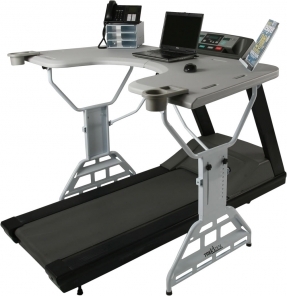 It’s an interesting concept for a home office, though I can’t imagine being able to work and read a computer screen while walking or running at any kind of workout pace. I guess any movement is better than none. Seems like it might be a kind of smelly office space too.